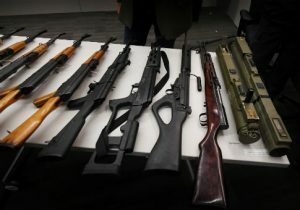 More than 1,700 court orders to temporarily seize guns from people deemed a threat to themselves or others across more than a dozen states were issued last year, according to an Associated Press report published this week. Red Flag laws became the most popular gun legislation at the state level, surpassing permitless or "constitutional" carry, after the murder of 17 people at a high school in Parkland, Fla., last year. Florida, Delaware, New York, Illinois, Massachusetts, New Jersey, Maryland, Rhode Island, and Vermont all passed versions of the law in the past year. Connecticut, California, Indiana, Washington, and Oregon already had similar policies before 2018. The laws are intended to allow certain people to petition a court in order to have firearms temporarily taken from somebody they believe to be a threat to themselves or others. Different states have different standards for who can ask for a court order, what level of evidence is required to extend the order, and how long an order lasts. The wire service examined court records from most of the states with "red flag" laws in order to determine how many had been issued last year. The AP said its estimate was likely far lower than the true number of orders because data from many states was incomplete, and they weren't able to obtain data from California. The laws have seen more bipartisan support than other policy proposals often put forward after major shootings. However, debate over the specifics of how the laws operate remains. The National Rifle Association told the Washington Free Beacon it supports the laws but only if they meet certain due process requirements. "Nobody wants dangerous people to have access to firearms, which is why the NRA supports risk protection orders with adequate due process protections and ensure those adjudicated to be dangerously mentally ill receive treatment," Jennifer Baker, a spokesperson for the NRA's Institute for Legislative Action, said. "The NRA believes that any effort should be structured to fully protect the Second Amendment rights of law-abiding citizens while preventing truly dangerous individuals from accessing firearms. We will only support an [Emergency Risk Protection Order] process that strongly protects both Second Amendment rights and due process rights at the same time." Baker said Red Flag laws must include penalties for those who make false or frivolous claims, require a hearing where the defendant is able to offer their own evidence, require judicial approval based on "clear and convincing evidence" before any confiscation order is given, require the judge to determine if the defendant meets standards for involuntary commitment and commit them if they do, mandatory mental health treatment for anyone subject to an order, a process for the defendant to challenge the order after it’s issued, the ability for surrendered firearms to be held by qualified third parties or sold by the owner, and a process for returning the guns when the order ends. She said the NRA does not support the Red Flag laws that states like California and Oregon currently have in place because they did not have strong enough due- process protections. The gun-rights group instead pointed to legislation sponsored by New York congressman John Katko (R), known as the Protecting our Communities and Rights Act, an example of a proposal they could support. "The NRA fights for the constitutional freedoms, including the due process rights, of all law-abiding Americans, every day in Congress, the statehouses and the courts," Baker told the Free Beacon. "Our record on this is clear. Due process of law is a bedrock of our constitutional freedoms. Without it, we would cease to exist as a free country. All fifty states currently have civil commitment procedures and many lack basic due process protections. This is unacceptable. The NRA believes that no one should be deprived of a fundamental right without due process of law." Gun-control groups support Red Flag laws as well but have emphasized passing new ones quickly over ensuring certain due process protections are included. Gun-control groups have promoted the laws in California and Oregon that the NRA spurned. Proponents have argued there is no reason to delay their implementation in other states. "As we mourn those killed in Florida, our elected leaders need to take action to prevent gun violence, or we will elect new lawmakers," John Feinblatt, president of Everytown for Gun Safety, said in a statement shortly after the Parkland shooting. "Policies like Red Flag Laws empower families and law enforcement officials to keep communities safe. There is no excuse to delay these types of common-sense solutions." Other gun-rights groups have opposed any implementation of Red Flag laws. Brandon Combs, president of the Firearms Policy Coalition, said his group "has consistently opposed ‘red flag' legislation at every level of government because they are a truly dangerous, unjust, unconstitutional, and immoral policy." He said the laws punish people who haven't yet committed a crime and can create deadly situations when police attempt to confiscate firearms from those subject to an order. "These Minority Report-style ‘pre-crime' laws target people for disarmament and seizure of their property before they even commit a crime," Combs told the Free Beacon. "In America, we have a foundational presumption that people are innocent until they are proven guilty of a crime. But ‘red flag' confiscation laws turn our very constitutional principles on their head and make everyone presumptively guilty unless they can prove they are not." While adoption of Red Flag laws has slowed in the past few months with bills in states like Virginia being defeated earlier this year, there are several states still considering Red Flag bills.